Canterbury’s range of rugby products span the on-field, training, casual and teamwear markets and includes, clothing, boots and accessories. For over a century Canterbury has dedicated itself to making stylish, crafted rugby products that are built to last. 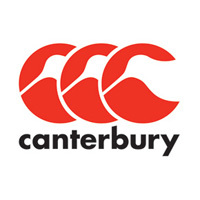 Famous rugby teams who proudly wear Canterbury kit include: England, Ireland, Leinster, Leicester – to name but a few. Canterbury are one of the biggest brands in Rugby and their boots are very popular indeed. We stock a good range of Canterbury rugby boots ranging in price from around £40-60. 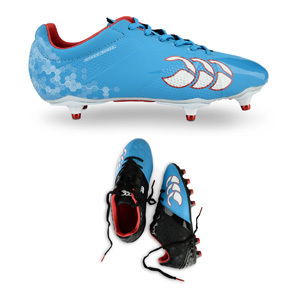 We also stock a Canterbury touch rugby boot. Starting from a size 13 our junior range of Canterbury rugby boots is one of our biggest sellers. Well priced and providing good quality, parents get great value for money. 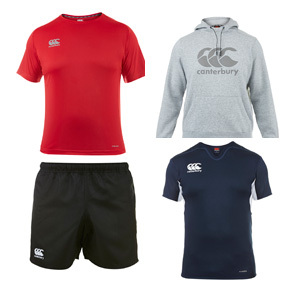 Well known for their clothing and tracksuit ranges, Canterbury are the dominant brand for rugby clothing in our shop. Canterbury rugby clothing provides great comfort and are one of our best selling product lines in the shop. We stock a small range of body protection, base layers and hoodies and tracksuits, perfect for lounging around in and sitting on the sidelines waiting for your moment in the game. We stock a small range of Canterbury rugby accessories, from mitts to scrum caps and kicking tees.